The mechanism involves electrolysis of water through the use of electrode energy and ionic materials moving to different electrodes (anodes and cathodes) through the porous special-coal diaphragm. The electrolytes moving to anodes are anionic minerals such as calcium ions, sodium ions and magnesium ions, and the electrolytes moving to cathodes are cationic materials such as chlorine ion and sulfur ion. The water electrode side is called Acidified Ionized Water. The Electrolysis-Ionized Water System is a product approved as a medical device by the Korea Ministry of Food and Drug Safety (MFDS). It produces alkaline ionized water, which is beneficial to health, and acidified ionized water which can be used for household purposes and purifies by removing various contaminants. Aging is the result of damage to bodily tissues by organic acids and active oxygen (free radicals). One feels and looks younger when reducing the concentration of waste products that accumulate in the body. The outward signs of aging include wrinkles, sagging skin, and gray hair. 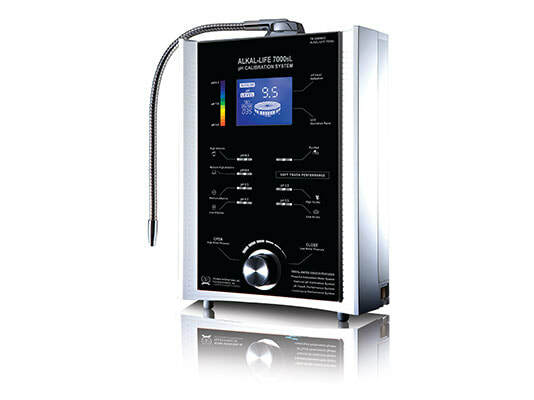 Rejuvenate by drinking alkaline ionized water to wash out acidic wastes. Naturally boost energy with superior hydration. It is known that thirst is a signal that more fluid is needed. Ignoring that signal can lead to loss of appetite, impaired physical performance, increased effort to physical work, nausea and difficulty concentrating. Superior hydration helps boost mental and physical performance. Water is essential to the body and the brain. All body systems experience improved function when properly hydrated - that includes digestion and metabolism. According to the United Nations Environmental Program, more than 20 billion pounds of plastic end up in the ocean yearly. In addition to the 17 million barrels of oil used in production, bottled water consumes gallons and gallons of water. Let's avoid using plastic water containers and fill our own bottles with alkaline ionized water. - Skin cleaning alternative, with pore-refining and cleaning action, beneficial for face washing and bathing. - Whitening action with chlorine ions effectively cleans skin. - Bathing and face washing - offering a beneficial astringent effect. - Washing feet, exhausted and soiled with contaminants. - Alternative to rinsing hair with tap water - use acidic ionized water to rinse after shampooing for softer, moist hair. - Use for brushing teeth. - Spray to eliminate bad breath. - Washing vegetables, offers excellent cleaning & help maintain color. - Household cleaning for removal of dust and dirt. - Use for cleaning bathtubs, toilets, and furniture. - Removing deposits from kettles, soak kettles or scorched pots in acidic water overnight. They will be clean the morning after. - Clean glass windows & mirrors with Acidic Ionized Water. Dust and dirt are easily removed with improved luster. - Clean chopping boards & dishes. Effectively cleans between knife marks. These statements have not been evaluated by the Food and Drug Administration. This product is not intended to diagnose, treat, cure or prevent any disease. This product does not cure cancer. It does not intend to provide diagnosis or treatment and only claims the statements in the medical device listing of intended use approved by the FDA. Specific medical advice should be obtained from a licensed health care practitioner. The information and personal testimonies about this product do not reflect any medical claims.